Happy Wednesday! I’m getting a bit of a late start again this week…but this time I really have no excuse. But! At the end of this week (so Friday) I have a HUGE announcement that I cannot wait to share! Eeeeee!! But I’m determined to keep it in until then. So let’s jump right in! I’m sure some of you may be tired of hearing about my trip to Miami, but honestly, I don’t care because it was fabulous. However, one thing that was not so fabulous was trying to cram all of my clothes into a carry-on. I am a severe over-packer, so even though we were there for just two days, I had trouble deciding what I needed and what I could live without. I mean, I’ve got to have options! One solution to this dilemma? A bikini that you can change every day! This BeachGal bikini comes with different attachments you can add to shake up your look! Pictured above is the bikini by itself with no attachments, which is a fun, classic look. This is perfect for day one on the beach! For Day 2, add a fun ruffle to both the top and the bottom- or just one! The attachments snap on quite easily, but hold well enough so you don’t lose a ruffle on the beach- no one wants that. Looking for a little more bling? This sequin trim is perfect for laying by the pool! Keep in mind that each trim option comes with pieces for both the top and bottom of the bikini. There are also many other colors- black, coral, leopard, and hot pink. I went with Aqua since it matched my floppy hat! I received this product courtesy of BeachGal Swim in exchange for a review, so I’m going to give my honest opinion. This bikini is very well-made, definitely better quality than the Target swimsuits I own! However, if I were to try it on in the store, I don’t think I would have taken it home with me. The bottoms fit well and have a lot of coverage, but the top did not cover everything the way I would prefer. I’m pretty modest when it comes to swimsuits, and the cut of the top didn’t exactly match my taste. But other than that, I think this is a great concept in swimwear, and is a great option for those of us with Severe Over-Packing Syndrome! How do you save room in your suitcase? Let me know! Yay for Thursday and yay for being finished with my test and final paper! I actually just submitted my paper- I finished in the wee hours of the morn, per usual, and I always like to read it over a few times after I’ve gotten a little rest, just to make sure it’s ready to go! I actually didn’t do that the first time I submitted a paper for this course, and just sent it off at 2 a.m., and ended up with an awful typo- a percent sign in the middle of a word. Luckily my professor overlooked that mistake, but now I feel like I have to turn in work that says, “Yes, hi, I am actually a competent student and am capable of producing senior-level, liberal arts-major quality essays”. But I digress. As with the majority of southern college-aged girls, monograms are a recent obsession I have been treating myself to on the regular (maybe too frequently, but it’s casual. It’s fine.). 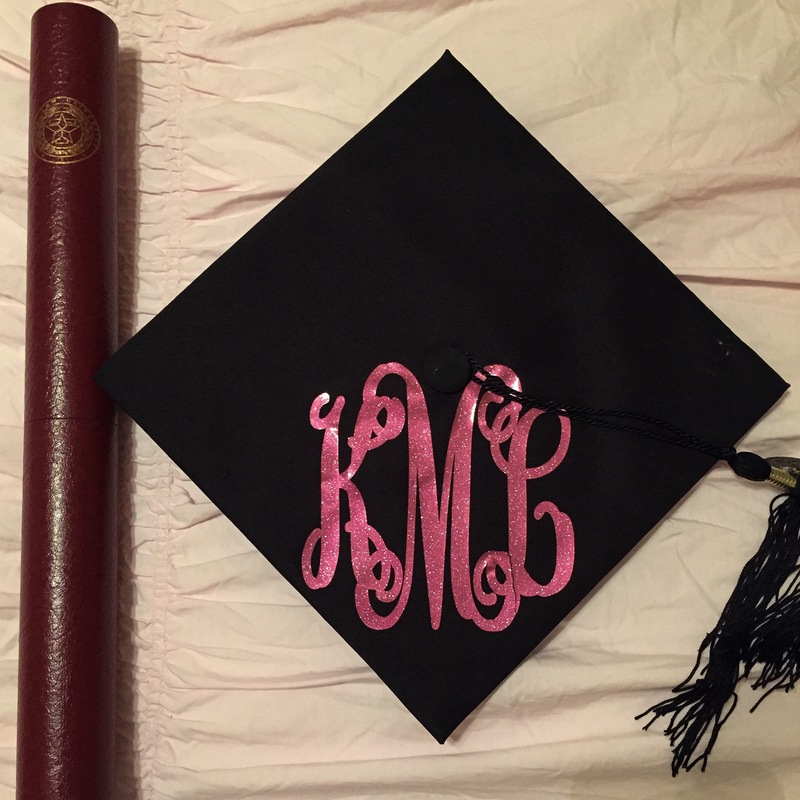 There’s something very personal about a monogram: it tells people who you are in the simplest of ways, and I love adding that traditional touch to my accessories. In fact, I recently told my sister that “if it’s not black, leopard, or emblazoned with my monogram, I’m not really interested”. So there’s that. 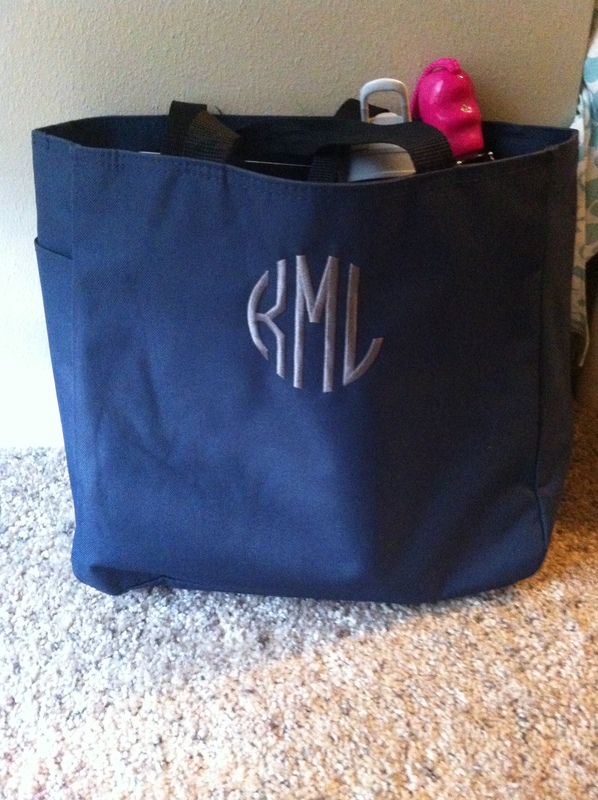 Marley Lilly, the monogram Mecca, recently sent me a few treats that fit perfectly in my fall wardrobe! 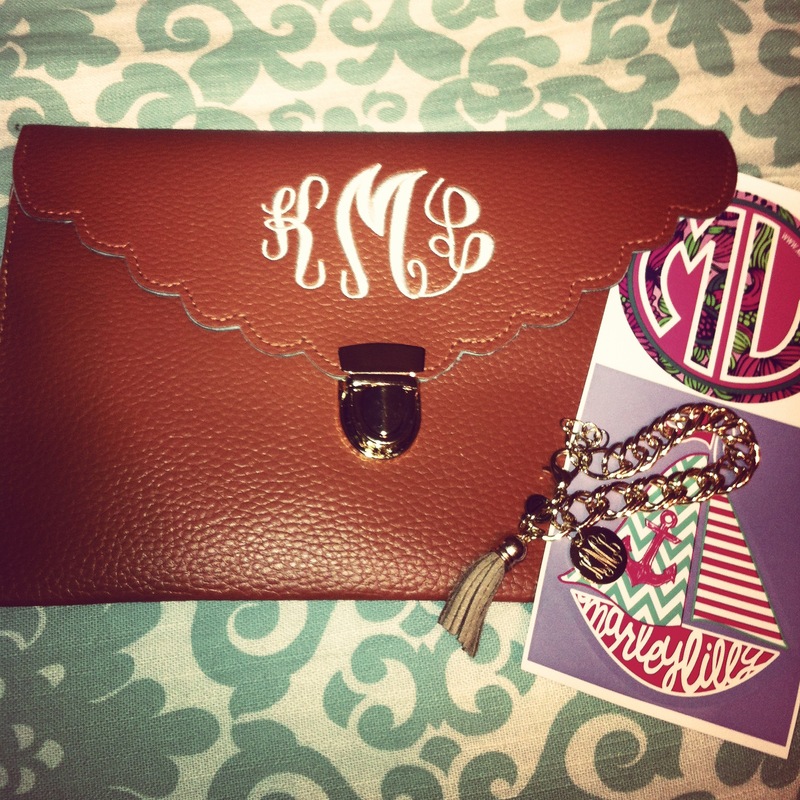 I was beside myself when I got the package, and have had so much fun wearing my new monograms lately! 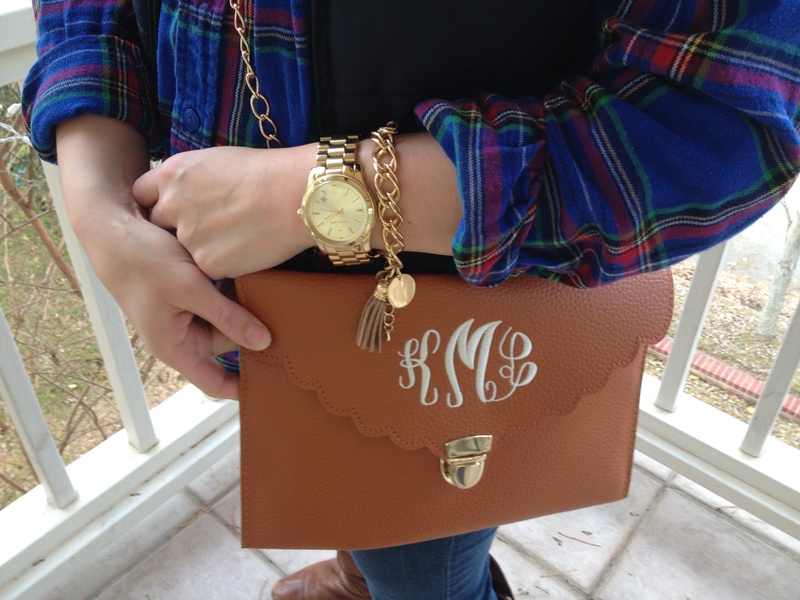 I received the Scalloped Luxe Clutch, which I have had my eye on for quite a while (now available in gold and beyond perfect for the holidays), and the Monogrammed Tassel Bracelet, which is a great addition to my stacked wrist. I wore this outfit to brunch and shopping last weekend with my parents when they were in town for Songfest, and I decided it was my favorite casual fall ensemble (so far). 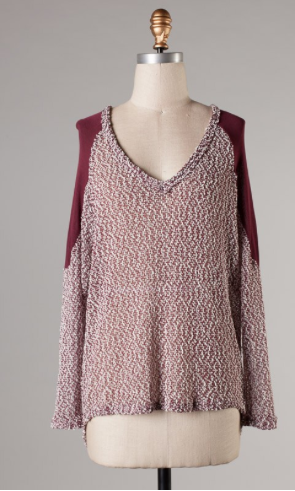 It’s casual and comfortable without being sloppy! Flannels are another one of my fall faves- they’re so warm and cozy, and can be dressed up (like this) or thrown over a t-shirt and leggings to go to class. True story: all of my flannels are from the men’s section of JcPenney. They’re always on sale and fit a little large, which is how I like them! Also my dad thinks the flannel trend is really awesome, and so he has been known to surprise me with flannels occasionally, which is adorable. 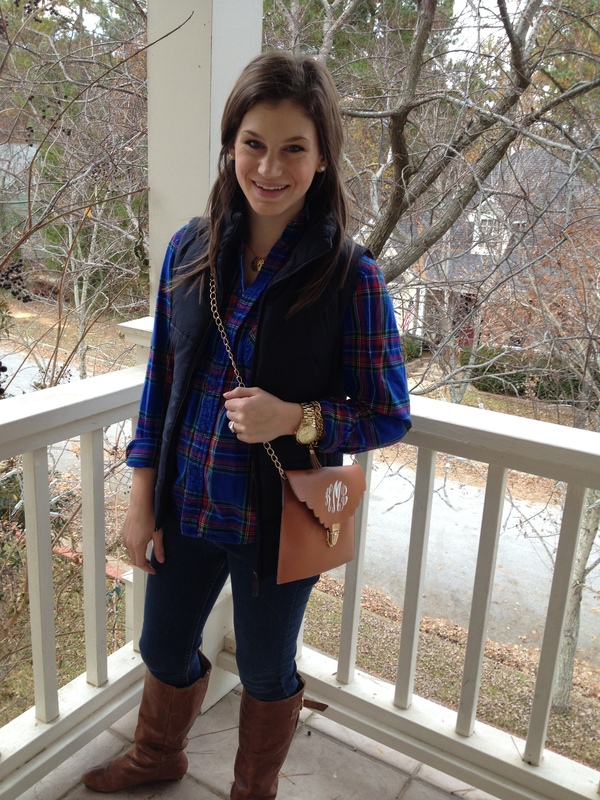 I paired it with my puffy vest, jeans, and riding boots, and added the clutch and bracelet to complete the look! I will definitely be wearing both the bracelet and clutch throughout the season and beyond! If you’re looking for the perfect monogrammed addition to your favorite fall outfit, head over to Marley Lilly for plenty of options! *I was provided free samples from Marley Lilly to review, however all opinions are my own! I hope everyone had a happy Thanksgiving! Mine would have been a little better had the Aggies beat LSU, but it was a great time to rest and be with my family! But now I’m back at school with the end in sight! I have a super busy week ahead with a test and final paper due, but I also have my sorority’s semi-formal on Friday, so that will be a great way to end a crazy week! As we all know, I love clothes and I love to get dressed. Recently, I’ve found myself taking more and more risks with my ensembles, partly because I have more opportunities to wear real clothes, but also because I’m older and don’t really care what others think about what I’m wearing. If I like it, I’m going to wear it. 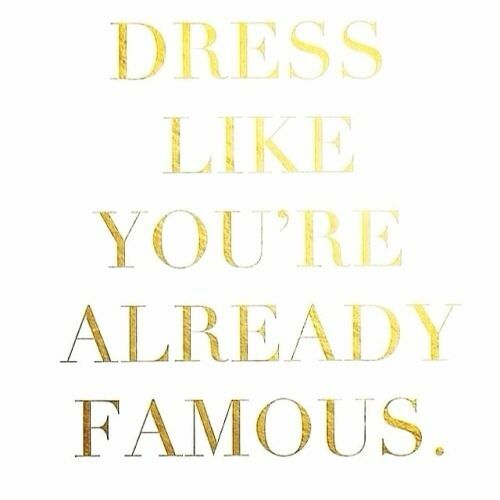 I came across this quote on Pinterest, and it really just sums up my take on style at the moment. I saw this and I instantly thought, “YES, obviously, this is how I want to live my life”. And then I wore fur to a football game and hot pink lipstick to school. One way I like to dress like I’m “already famous” is with fabulous accessories. 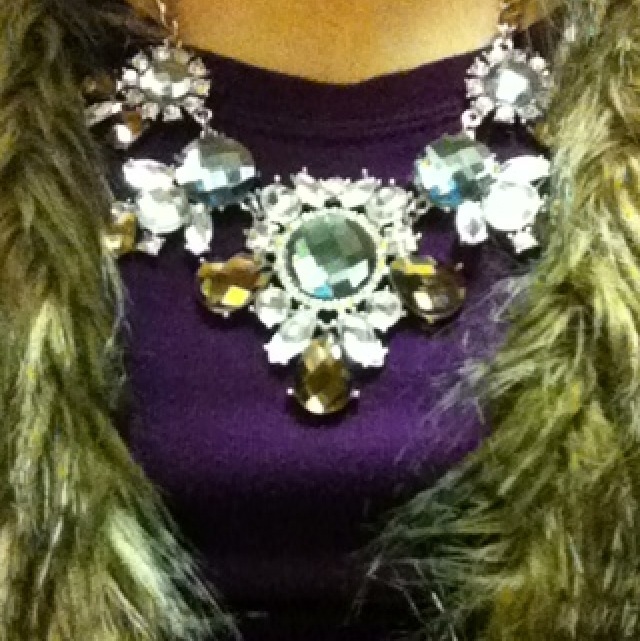 I’ve been searching high and low for a neutral, crystal statement necklace to add to my single-girl closet, and I was pleasantly surprised to receive this gorgeous piece from Marley Lilly in the mail last week! The best part? Marley Lilly is running a Cyber Monday special where you will receive this statement necklace for free with any $50 purchase- no coupon code required. So head over to Marley Lilly, stock up on monograms for Christmas presents (and yourself, duh), and score this piece to help you dress like you’re already famous. Sounds like a great Monday, doesn’t it? Last Tuesday of summer! Yikes. Obviously I’ll spend it in the best way, watching Pretty Little Liars and eating Ben & Jerry’s. Thanks to my roommates, I have a new favorite flavor- Milk & Cookies- it’s delicious! I’m obviously making the most of my senior year of college by eating ice cream and watching bad TV. Not sorry. 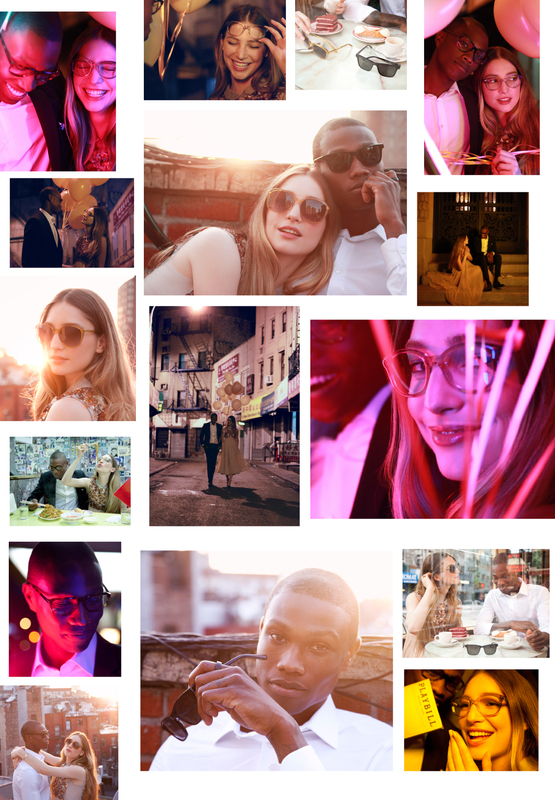 I was recently introduced to treat.by Shutterfly, a new website with personalized gifts, cards, and more, and I fell in love with the site and everything it has to offer! I love sending little treats to my friend, especially with a personal touch. 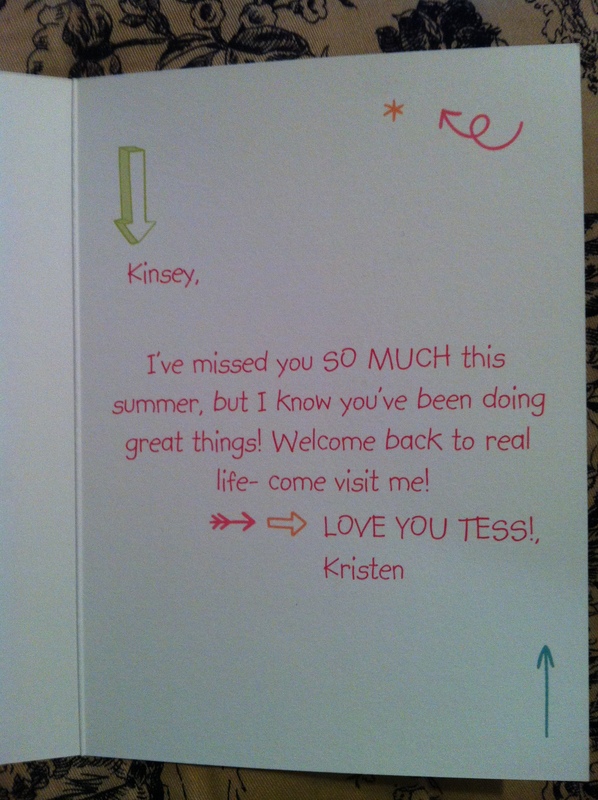 Instead of a birthday card or something a bit more predictable, I decided to send a “welcome home” card to my best friend Kinsey. We’ve been best friends since our freshman year of high school, and we go to school across the state from each other. We usually are able to spend the summer together, but this year I stayed in College Station, and Kinsey went to Europe, stayed in Lubbock, and then traveled around Texas as a camp counselor. So needless to say, we weren’t able to see each other very much, and it was so sad- she’s like my sister! But I was able to write her letters while she was at camp, and she had her phone on the weekends, so we were sort of able to keep each other updated on life. I had so much fun making this card for Kinsey- I loved picking out my favorite pictures, and even though picking out the layout was hard (so many choices! ), I finally found the perfect one! 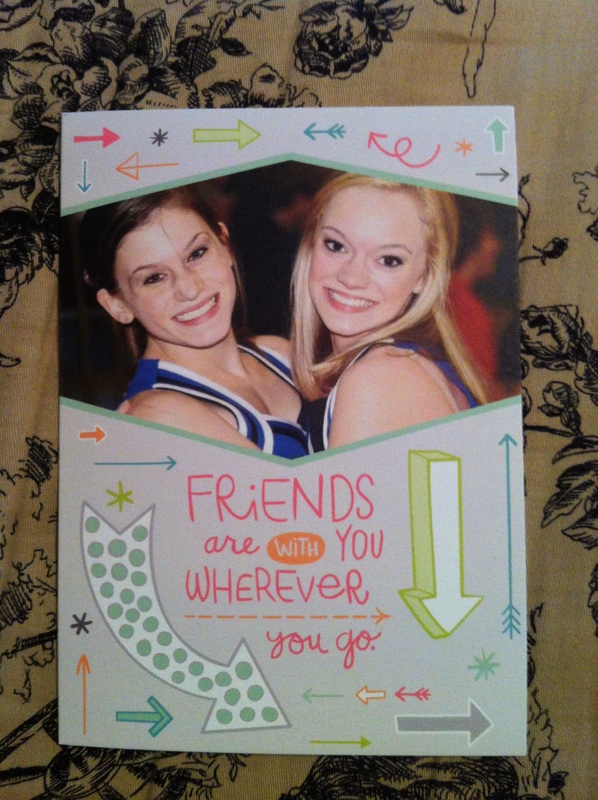 I love this quote because it sums up our friendship- we’re far apart, but we’re always friends! Also yes, that photo is from our high school cheer days- but it’s one of my favorites! 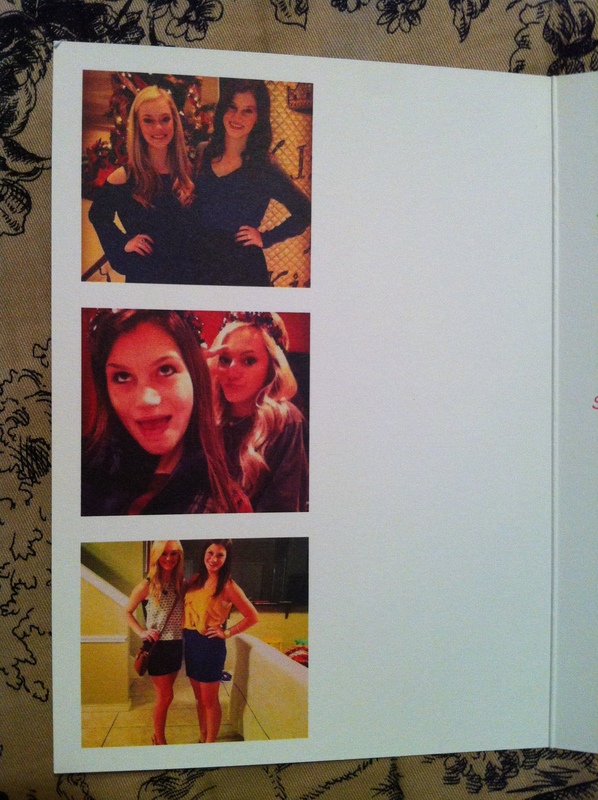 I chose my favorite pictures of us for the inside of the card-you can add captions, but I chose not to. Also, these little squares are the perfect size for Instagram photos, which we have one million of. I added a personal message on the other side, and on the back! It’s so easy to create special, personalized gifts and cards for your friends and family with >treat, so the next time you want to give something more than the generic grocery store card, head over to treat and make something just for them! It’s always in style to show your friends and family how much you love them! I was actually able to see Kinsey this past weekend- we were both in Tyler for the last time before school started- and was able to give her the card in person at lunch. 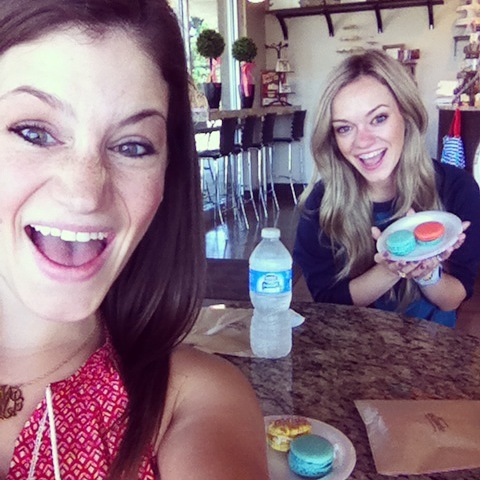 She loved it, and we had a great time eating barbecue and macaroons and catching up on what had happened in our lives this summer. I hope everyone is having a good week- halfway through! Okay, so I’ve been meaning to post this for nearly forever. It’s sad. But I wanted to wait until I’d bought a few things on my shopping list that I thought would pair well with this skirt, and then I wanted to take the pictures on my balcony at home, and then I completely forgot about it until five minutes before I left this weekend, so I frantically threw on the outfit and had my mom snap a couple of pictures. I look a little disheveled, and I’m also not wearing much makeup, so there’s that. But I decided I couldn’t put it off any longer, so here it is! 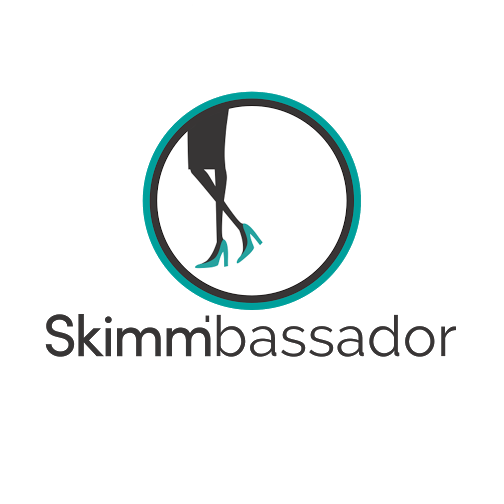 I was recently contacted by Jane from eShakti to do a product review. I hadn’t heard of eShakti, so I did my research and was so pleased at what I discovered! Not only are their clothes adorable, but they offer customization of size and style on every garment. They have this awesome chart with every size from a 0-36, and (my personal favorite) you can enter your height and specify what length you want your skirt/dress. This is revolutionary for short girls like myself! I’ve always wanted to try a mid-length skirt like the one eShakti sent me, but I could never find one that hit in the right place- they all made me look super stubbs. 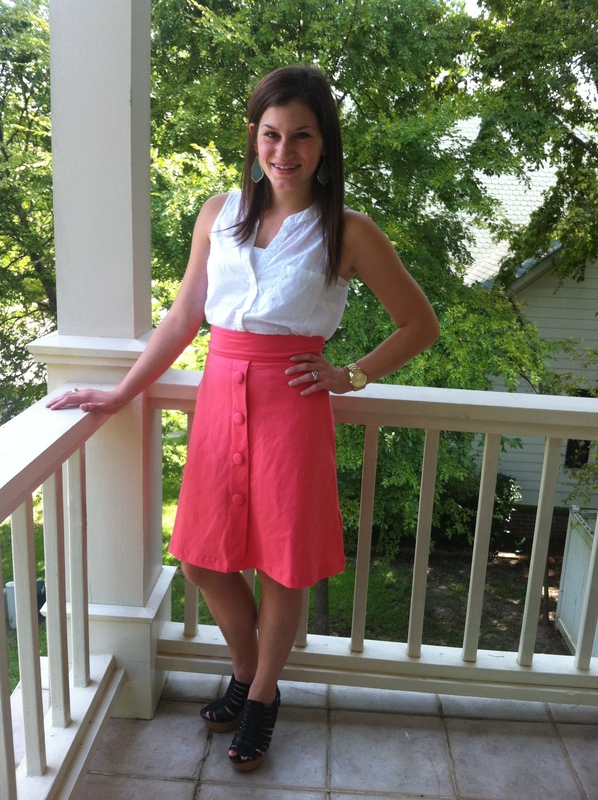 But when I tried on this skirt, I loved the length, not to mention the bright coral color! Unfortunately, this skirt is no longer on the website, but I love this one and this one. 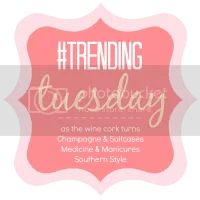 I paired it with my trusty Swiss dot tank from Old Navy (similar), my Kendra Scott Alexandra earrings in chalcedony, and my black wedges from Target for a cute, casual look that’s perfect for lunch with friends! 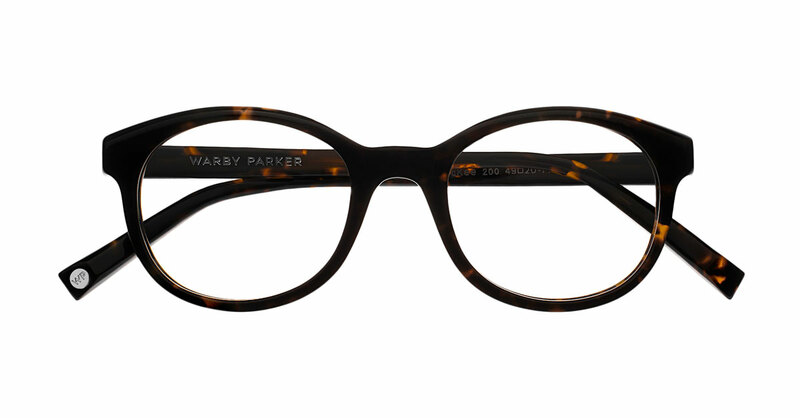 This would also be adorable with a graphic tee and white sneakers for a more trendy look. I’ll definitely be working this skirt into my work and everyday wardrobe! If you’re like me and have #shortgirlproblems with skirts and dresses, head over to eShakti for a custom fit! One thing I love about summer is wearing sandals. I love for my feet to be free, whether I’m going to the pool or to the office. I recently received these gorgeous Riviera Sandals to review from Fibi & Clo, an up-and-coming line from a Texas-born designer (who named her company after her cats- obviously we’re on the same page.). These sandals are the perfect mix between casual and dressy. 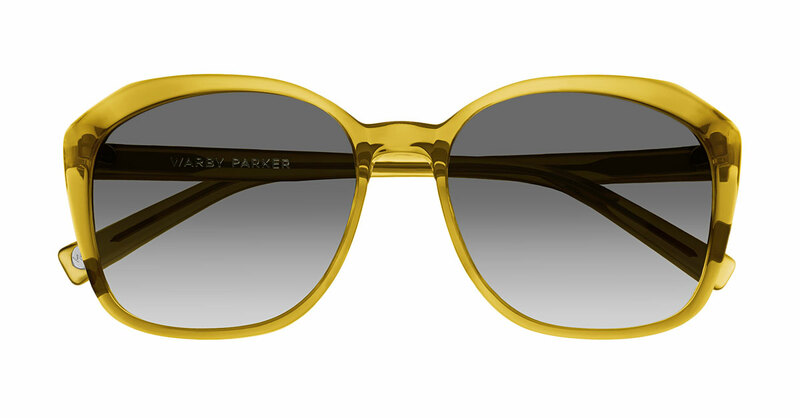 They’re a very simple style, but the jewel accents make them really stand out. 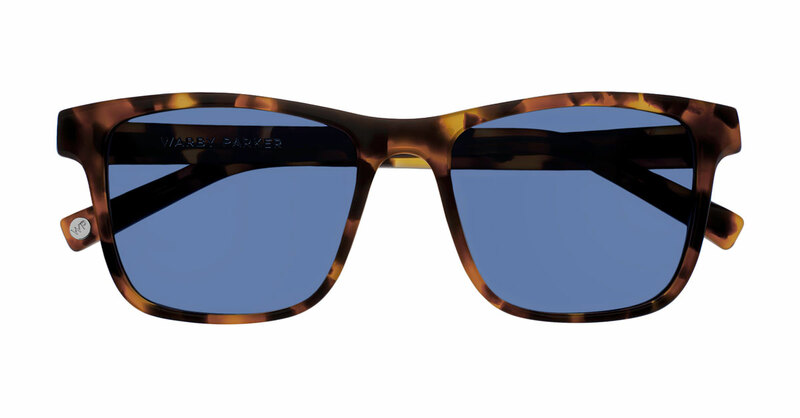 I’ve worn them both to work and to the pool- if that’s not versatility, I don’t really know what is. Another thing I love about these sandals is the water-resistant material they’re made from. I don’t like to wear many of my other sandals around water because they’re leather and I don’t want to ruin them. 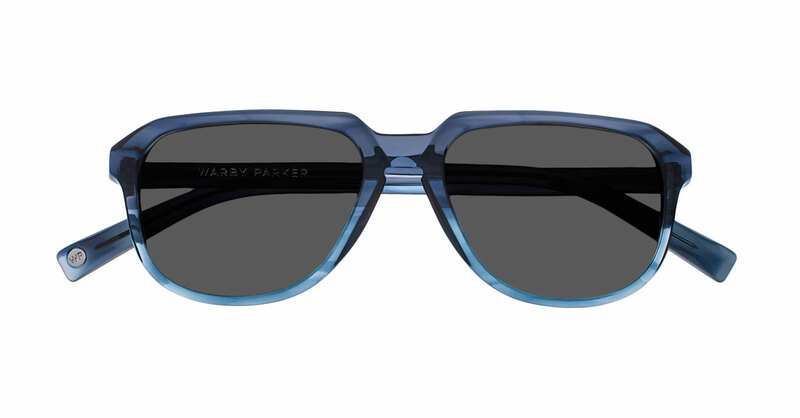 These, however, were practically made for a trip to the pool- the water slides right off and they’re good as new! I’m certain these will be making many appearances on the blog in the near future. 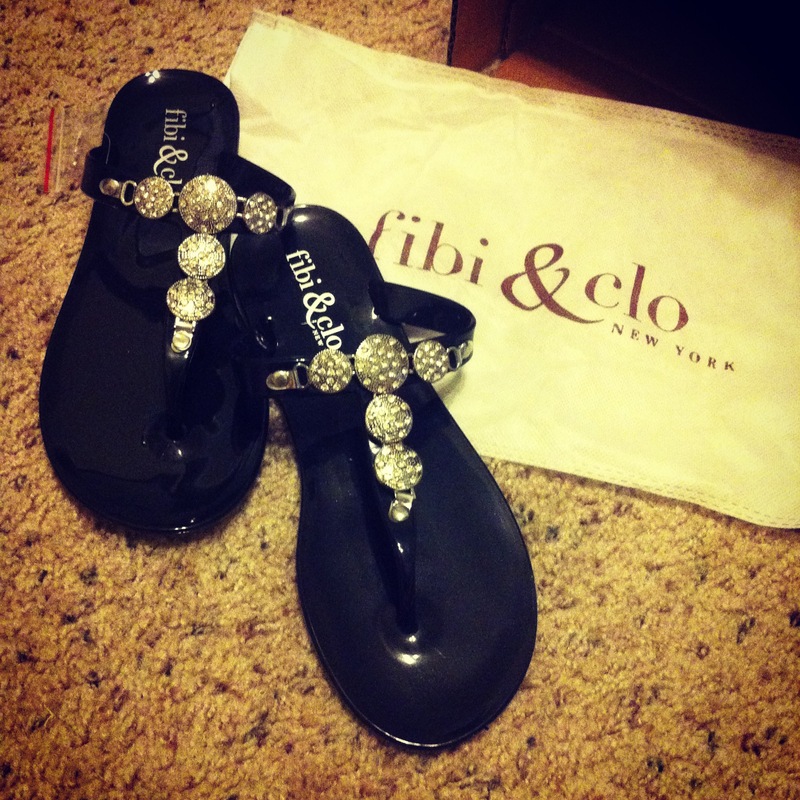 In addition to adorable shoes (loving these, these, and these), Fibi & Clo also gives back, which you know I’m all about. They have recently started a program called “Get Her On Her Feet” that teaches women in impoverished countries business & entrepreneurial skills to help them build a better life for themselves and their families. When you host a Fibi & Clo shoe party, they will make a donation to Get Her On Her Feet based on how much merchandise the hostess sells. So the more shoes you sell, the more opportunities other women have to build a shoe business and earn an income- everybody wins! If you’re looking to add some summer sparkle to your shoe closet, head over to Fibi & Clo and check out all of their fabulous footwear- you won’t be disappointed! I hope everyone had a great Valentine’s Day this weekend- I know I did! My roommates and I went to dinner Friday night, and on Saturday I went to an Aggie baseball game with some of my friends. I’ll be honest- baseball isn’t exactly my favorite sport (I told one of my guy friends that it was the first time I’d ever stayed all nine innings at a baseball game and he was appalled). However, Aggie baseball is a different experience- the student section is quite hilarious. My all-time favorite college sport is Aggie football, obviously. I’ve been lucky to witness some exciting things since I came to Texas A&M in the Fall of 2011- the move to the SEC, a shocking win over #1 ranked Alabama in 2012, and, of course, Johnny Manziel. There’s nothing that compares to gameday in Aggieland, and one of my favorite parts of gameday is getting dressed up. For real. Ever since we entered the SEC, gameday style has gotten increasingly more formal. My freshman year I would wear Nike shorts and a maroon tee shirt, but the tables have definitely turned! Unfortunately, it’s really challenging to find Aggie maroon. There’s raspberry, crimson, and red galore, but if you find something that fits in true Aggie maroon, it’s a poor choice to not buy it immediately. I recently stumbled across Sideline Sass, an Aggie-owned online boutique that carries a variety of affordable gameday attire- in the right maroon- it’s a miracle! These Must Be Maroon shorts are definitely a staple for August and September games. I love the fun, floral pattern on these, it definitely dresses them up! Next is this Knit Together sweater. I love the solid panels on the shoulders mixed with the variegated body. This would be a great option for cooler, night games. I also love this Flash Back dress. Dresses are by far my favorite game day outfits, simply because they’re effortless, yet still put together. In addition to these and more maroon pieces, Sideline Sass has a wide array of clothing and accessories for many different styles and tastes. So if you’re an Aggie girl looking for gameday wear, or if you’re just looking for unique pieces to add to your closet, head over to Sideline Sass!